Another Friday in the Big Brother 2014 house has passed us by and we had quite a bit of action take place. The HGs seem to have a plan in place for the main target for Week 3 on Big Brother 16, but like any other plan on Big Brother, it seems to be hitting a snag here and there and we could see Caleb going home this week over a backdoor of Devin! Paranoia is taking over on Big Brother 16, so check out the highlights below in our Big Brother 2014 spoilers! We had a lot of fish and Jeff Schroeder loops on the Big Brother Live Feeds yesterday. Not sure why, but the Nomination Ceremony had the feeds down for like 3 hours! Either way, we had a little shocker with the nominees as the feeds cut with Victoria being the second nominee for Nicole. However, the Week 3 nominees were announced and Victoria was not put up, but Donny was put up in her place! We all know that Caleb was supposed to throw the Battle of the Block competition and keep Amber safe for the week (Nicole’s other nominee), but it was scary seeing Donny on the block again. The reasoning for Donny: it appears that he is thinking the Bomb Squad is still in place and Nicole is working with them. He questioned Christine and some of the other BS members, so people are starting to get worried about Donny and where his alliances land. There was talk of him trying to flip the house before the vote to keep Paola also. Donny does not trust Derrick or Frankie, so Team America is not working well together. I am worried about Donny, as many people want him gone and soon! For the Battle of the Block competition, not sure of what they had to do, but it looks like Caleb could not throw the competition based on what they had to do. Jocasta was not very good and they lost based on her. It turns out the competition got to her, as Jocasta was sick and throwing up afterwards and it could have been from heat exhaustion and dehydration, which is why she never leaves her room! 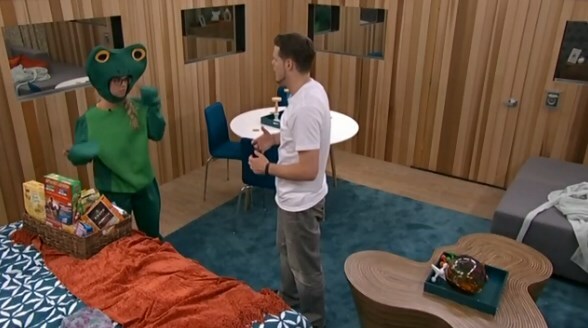 Also, Nicole got a penalty of wearing a frog costume for the entire week (including the live show) because she was dethroned as HoH! Besides that, it was pretty calm and everything rests in the hands of whoever wins the Power of Veto today! Then what they do with it at the Veto Meeting on Monday. As much as the plan is in play, people are starting to questions things and considering winning the veto and keeping Caleb on the block. Maybe taking Jocasta down and keeping Caleb as the target and Brittany has been mentioned a few times, especially since she is talking way too much to everyone and no one trusts her. Stay tuned to today, as this Veto Competition and players is going to be huge! They all agreed 24 hours ago that Devin had to go. HOw did things change so quickly. Sheeeesh the thought of keeping Devin longer makes me physically ill. Can’t wait to see what happens during veto today. Everyone (not just this house) keeps looking around for new targets and forget to see the HUGE X on the target they planned in the first place. Sure Brittany talks too much and Donny is sketchy at the moment. But if they don’t get rid of Devin now, he will be a much tougher person to get out because he’s so good at comps. You CAN’T lose focus, HGs!!! Just checking in and kind of wishing I hadn’t! You are so right–what is wrong with these people?! Who knows when or if they will have such an excellent opportunity to get rid of Devin! I think there must be something in the water in that house that is causing them to keep changing their minds. I can’t have my BB eye candy leaving!! Caleb needs to stay and Devin needs to go! It’s easy to forget your original target when he has no power.. This is sometimes a fatal mistake in BB. Because power shifts from week to week and the target you forgot about now has reign over the house. I still expect Devin to be evicted this week. Unless he wins POV. But i must admit that Caleb is the bigger threat in my opinion. They have officially neutralized Devin with going against his eviction plan and keeping Zach. His HOH reign left him without a single alliance. I know it’s risky keeping him in the game. And i don’t suspect they will. But having a bigger target in the house other than yourself can work to your advantage. Cat, You are absolutely right.. I’ve seen this time and time on BB. once the main target is no longer HOH, They think…….. He is no longer in power… Therefore he is harmless. As if HOH is a one- time deal… When will they ever learn????? It is very frustrating for where I’m sitting. Most of them get HOHitis. Even the ones that are level headed seem to go on a power trip. They are brought down with an earth shattering THUD when their time is up. This is what happened to Devin. I’m not even sure who i’m rooting for at this point. I had picked Derrick but he’s turning into a blabber mouth. I wish he would keep his tongue from wagging so much. I really liked Derrick in the beginning as well, but it seems as soon as they become HoH, they change, a lot!!! I think Paranoia is the biggest disease in the house. And it gets amplified in the HoH room because you’re calling attention to yourself with your noms. So Derrick’s strength of smooth talking just jumps into overdrive. I still like him best, but I do agree he should dial it down a notch. And regarding keeping Devin for the drama, I know that’s really what most truly hard-core BB fans want, but I’m all about NOT getting toward the end with too many “bad” people still in the house. Then you wind up with what we had last season with no one left in the house you could cheer for when there were still 5-6 people left in the house! I say get Devin out while he’s deflated and your plan is actually working. Move on to Caleb next. I do agree Caleb is actually a bigger threat. But the thought of Devin even possibly getting close to the finals and winning too many key comps to get him evicted…. Just too scary to flirt with!! It’s madness I tell you…… Complete and utter madness. for Pete’s sake houseguests. stick to the plan. Get rid of Devin before it’s too late……. GEEZ. Hi Mary, Happy Saturday to you!!! And a happy Saturday back to you two! And may I add my pithy comment to yours….DOUBLE GEEZ!! Darn…my break time is over. See ya later! Hi Joyce! Thank you and happy Saturday to you as well AND to all my BB buddies! I think the veto players are being picked right now. I think so, Live Feeds aren’t on. Honestly, i think it would be hilarious if Devin was picked and won. I know a lot of fans don’t like him (including me) but i love the drama he brings. I agree hahaha! It would be such a hoot! I do’t like Devin either, but I like the drama too!